I always hope to post more than I actually do. I get ideas throughout the week, mostly on the drive home, and this week was no different. Do I want to talk about our teething battles? Or, maybe our last family day adventure? They say the road of life is paved with good intentions, and more and more I find that to be true. I often have great intentions, that I have difficulty following through. This week's You Capture assignment was Sunrise/Sunset...Well, my intention of getting the camera out the door early one morning was never fulfilled, but I did catch a full moon a couple weeks ago that sort of fits. While I was taking this picture I was thinking how cool the moon looks and that I couldn't wait until my daughter can run around outside and I can start showing her all the cools things that are around her everyday. TV will not be the center of her life like it was for mine...I mean, I still love TV and she will too I'm sure, but being outside on a crisp fall day with the leaves falling and deer in the back field beats any show on TV. I want her to experience all of that...She's only 6 months old, but I'm counting the days when I can run around outside with my wife and daughter and play in the leaves without looking ridiculous. For more 'You Capture' shots check out the I Should Be Folding Laundry blog. More kids need to enjoy being outside. I am with you on that. Great shot. I never can get a good shot of the moon. Bravo on the moon shot! Those are hard to do! The only way I get outside with my teens these days is if I'm driving them somewhere. Most of the time they're so plugged in I'd have to cut the electricity to get their attention. I remember going outside playing in the park hearing their laughter . . . 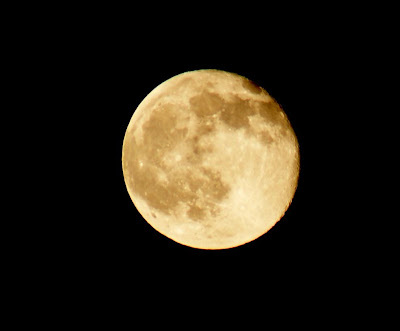 I'm pretty sure the same night you took this I took one of the moon too a couple weeks ago. It was HUGE! Your excitement for the days you can play with your 6 month old are touching. Today at the grocery store there was a little boy totting in front of us while his father held his hand. It was the adorable kind of "I just learned how to walk" sort of totting. My husband looked to our 5 month old in her carrier and crooned to her about how he couldn't wait either. You fathers, you can be pretty sweet sometimes. wonderful post..I relate..so many good intentions that never seem to play out. Life has a way of speeding by so fast we barely notice it when we blink.